Taiwan-based ePrice.com.tw shared the recent statistic about the mobile market in Taiwan. The research conducted mainly counts offline sales and is for the period of the month December of 2017. 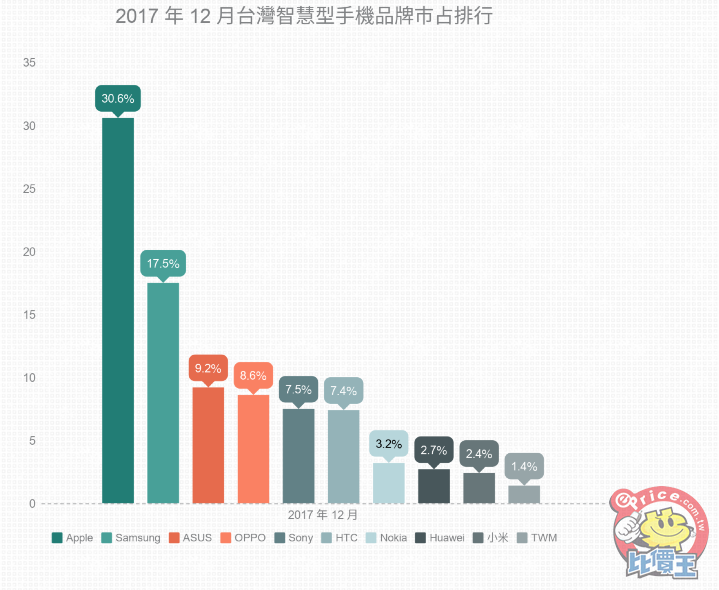 According to the data, Nokia-branded smartphones grabbed 3.2% of the market in December 2017 which was enough to place HMD at the 7th place of smartphone manufacturers in Taiwan. Taiwan is a high end market with a population of 20 million. Describing it as a high end means where buyers prefer higher end devices, and the fact that Apple is the No.1 brand with 30.6% marketshare and has 60% in overall smartphone revenue on the market kind of confirms that. HMD’s revenue share is “just” 0.6%, meaning that the average selling price of Nokia phones is far below the average selling price of the whole market. 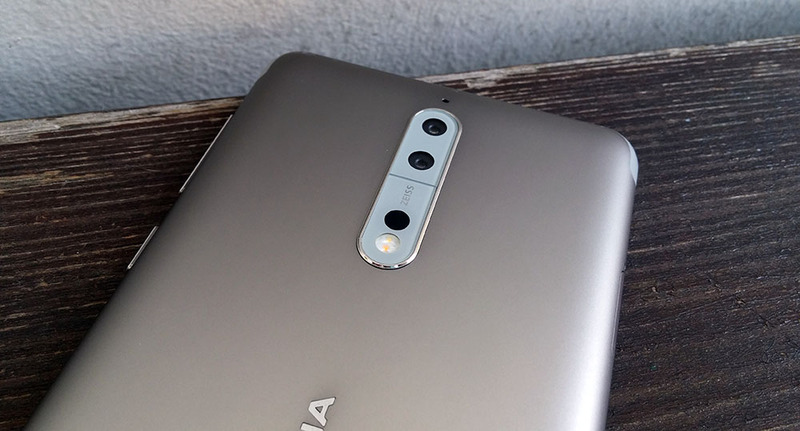 In other words, HMD sells more lower and mid range devices than high end, but it’s good to keep in mind that we cannot really describe the Nokia 8, HMD’s highest offering, as a high end device in terms of price like the iPhone(s), because the 8 is half the price. Overall, 614,000 smartphones were sold in Taiwan in December 2017 offline, which translates to roughly 20.000 Nokia smartphones. If we assume that HMD had the same or approximately the same marketshare throughout October and November, we could put the number of units of smartphones HMD sold in Taiwan during Q4 2017 at roughly 50,000 or about 3% (2.8% per my calculations based on October and November report) of the smartphone market. This is a solid result, considering that Nokia’s global marketshare with Lumia peaked at 3%. Keep in mind, the report doesn’t consider online channels of sales, but the market share should remain about the same, while the sales number should, obviously, be higher. Counterpoint Research released the stats for the Indian market for the whole Q4 2017. The biggest surprise comes from Reliance Jio and their “Jio phone”. Jio phone is a smart feature phone that Indian operator Reliance Jio offers “for free” (deposits and return of the device are required), with cheap data packages. It literally shocked the market and took 26% of the feature phone market in Q4 making the top spot. Nokia-brand or HMD Global was No.5, and that’s a place worse than in Q3 when HMD was No.4. In Q4, HMD grabbed 6% of the market, while a quarter before the feature phone marketshare was 8%. This doesn’t necessary mean that HMD sold less feature phones in Q4 than in Q3 (though it could be), because it depends on the overall number of feature phones shipped. Samsung had 23% of the feature phone market in Q3, dipping to 15% in Q4 2017, so we can say that the Jio phone really disrupted India’s feature phone market. Even though the Jio phone is not directly related to Nokia, it is important in few aspects so allow me to share some more of my observations (agree or disagree with them, tell us in the comments). 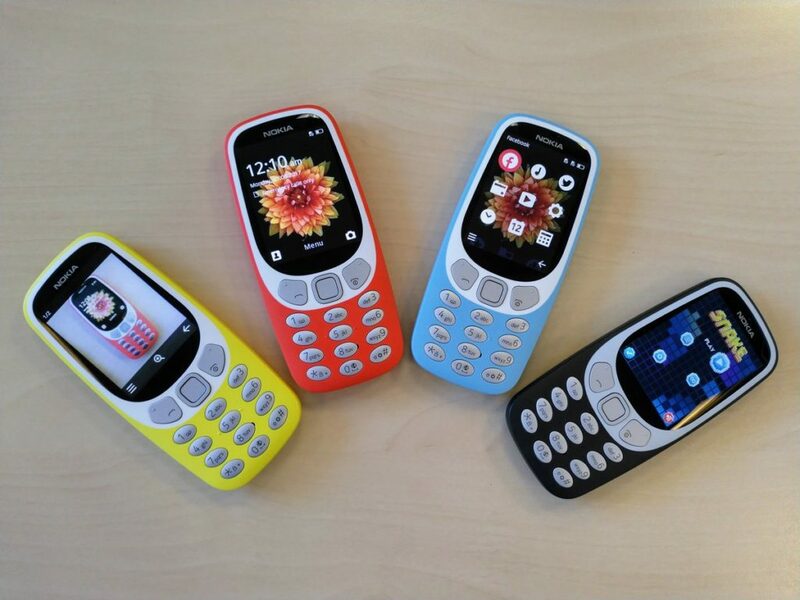 Today we also heard a rumor that Jio is working with HMD on bringing the rumored Nokia 3310 4G and even future 4G Nokia feature phones on their network. At first, this doesn’t seem like a smart move, because the 3310 4G would directly compete with their own Jio phone. The question is, is the Jio phone project (meaning the data plus the phone) profitable for Jio? If not, or yes, but with a small margin, offering a highly attractive Nokia phone (like the 3310 4G or maybe another re-born Nokia legend like E72) could make more profit for Jio than the Jio phone itself, even though I don’t believe anything will outsell (in terms of volume) Jio phone at the moment. Also, an attractive Nokia device at a decent price could attract more customers. The other thing is the importance of 4G feature phone for the future. I’m not sure is the early success of Jio phone the result of the price or the fact it uses 4G, but Counterpoint argues 4G could be the reason. Counterpoint’s Mr. Pathak said that the 4G feature phone market could reach 200 million in volume in the next 5 years in India. It will be interesting to follow this story, because Jio phone and India are the test subjects for 4G phones on the market and the success or failure of 4G feature phones in India will reflect in other manufacturers’ global phone strategies. I, maybe, went a bit off topic with this Jio phone “analysis”, but I really think it is important how the market reacts to an “unusual” device, like a 4G feature phone. In terms of smartphones in Counterpoint Research’s report, HMD is not in the top 5 manufacturers (No.5 had 6%), so HMD wasn’t mentioned at large in the report. CR did mention that new launches from HMD (and other brands) drove shipments and that HMD had a good first year of operations in India. No global numbers of the phone industry are available at the moment, so we’ll have to wait a little longer to see global reports.